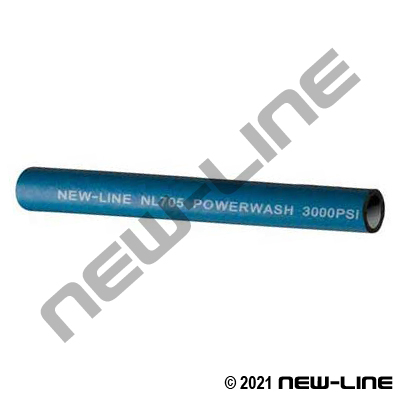 This is a popular, smooth cover, lightweight hose specifically designed for use on pressure washer machines with working pressures up to 4000 psi (NL707), and temperatures up to +121C (250F). It is very flexible and has a 4:1 safety factor. Its tube and cover are specifically compounded to resist cleaning chemicals that can dry out hydraulic hoses and cause premature failure. Its tube and cover are resistant to heat, oil (RMA Class B), and abrasion. The 'smooth' cover also allows it to be wiped down easily. Popular assemblies are listed below; other assemblies can be made up from our bulk stock. The 1/4" size is also commonly used in the carpet cleaning industry to transfer hot water and additives to the wand; the wire braiding provides extra kink resistance at high temperatures and provides added coupling retention. Typical Fittings: N60311 Series permanent crimp fittings, NL730 & NL735 bend restrictors, ST-CPLR-FNPT-BR quick connects. Some users prefer using SAE100R1AT field attachable fittings for temporary repairs, but this is not recommended by the manufacturer or New-Line. Construction: Tube: Smooth, black nitrile rubber. Cover: Smooth, blue nitrile rubber. Reinforcement: One wire braid.